That’s the RigRack motto. It might also be your solution for happiness. 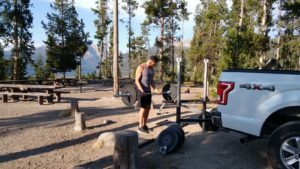 The RigRack’s versatility allows you to train anywhere. As a result, you can address your mental and physical health through three proven methods for adding happiness: strength training, sunshine exposure, and time in nature. Unfortunately, happiness is not a given. About one in six Americans experience anxiety on most days. About two-thirds of the population experience a bout of depression each year. Depression and anxiety lead to other significant issues: difficulty sleeping, pain, becoming socially withdrawn, and poor overall health. As a result, the US spends about $50 billion EACH YEAR to treat depression and anxiety. Thankfully, there are a few proven and accessible options to improve your mood and decrease any depression or anxiety that may exist. One way is to strength train. A review of over 200 studies showed strength training reduces anxiety, depression, and improves overall mood (1). Twenty-five studies in the review focused specifically on strength training and depression. Not only did strength training reduce depression symptoms, but it was much more effective for depression when compared to other types of exercise. Strength training makes us happier due a few reasons (1). It increases the production of neurotransmitters, which are chemical substances that send signals between nerve cells. One neurotransmitter is dopamine, which is responsible for delivering the message of joy that we feel in positive situations (e.g. receiving a surprise gift). Training creates new blood vessels in the brain, which enhances the amount of oxygen and nutrients delivered. New nerve cells may also be created as a result of strength training. Sunshine is another happiness stimulant (2). People who are exposed to sunlight early in the morning sleep better at night. Sunshine exposure also improves mood and energy levels. One of the effects of sunlight is to internally program the human body to know when to produce hormones, including melatonin, that stimulate sleepiness or alertness. Also, sunshine stimulates the production of serotonin, a neurotransmitter that boosts mood. Time in nature is a third option which adds to happiness (3). Simple activities, such as walking, in nature reduce brain activity in places where high activity is a sign of possible mental illness risk. Lift heavy anywhere…including in the middle of nature on a sunny day. The RigRack gives you the opportunity to take advantage of three proven ways to boost your happiness. Squash stress and unhappiness. Get happy; get outside and train! Mead, M.N. (2008). Benefits of sunlight: a bright spot for human health. Environmental Health Perspectives, 116(4), A160-A167. Bratman, G.N., Hamilton, J.P., Hahn, K.S., Daily, G.C., & Gross, J.J. (2015). Nature experience reduces rumination and subgenual prefrontal cortex activation. Proceedings of the National Academy of Sciences of the United States of America, 112(28), 8567-8572.